This entry was posted in Uncategorized and tagged Affinity Mingle Blog, Affinity Mingle Plus Size Clothing, Asos Curve Skirt review, Curvy Fashion, fatshion, Hell Bunny Plus Size Review by affatshionista. Bookmark the permalink. Love your outfit. Looking good !! Thanks Nancy, turned out to be pretty fun. I LOVE LOVE LOVE this!! 😉 I have the same skirt from ASOS and always have to iron it! I love this skirt, but i hate the iron. You look fangtasticly spooktacular in Hell Bunny. Thanks Stina. I am pretty amused by it. Thanks for being my fashion mentor. I pretty much am not a Halloween sweater (or any holiday) wearer but i am in love with this sweater… looks great on you.. i love the boots too!!! I need the sweater in my life! Oh my gosh!!! Such an amazing find! I love it. That sweater is fantastical ! Love this outfit! I really appreciate all the information provided in your posts, it’s super helpful. I managed to order that sweater in a 4x (not easy!!) and can’t wait for it to arrive. Can you tell me where you found the spider appliqué? It looks so cool on that skirt! These are not exactly like mine. My seller does not seem to have them anymore. Thanks for the links! <3 I really want to try the DIY project too. I have a couple of extra felt appliqués I could send you if you want me to. If you send me your snail mail address I will send them today. Thanks so much Affinity! Such a sweet and kind offer!<3 I'm super excited to try and recreate your spooky cute skirt! 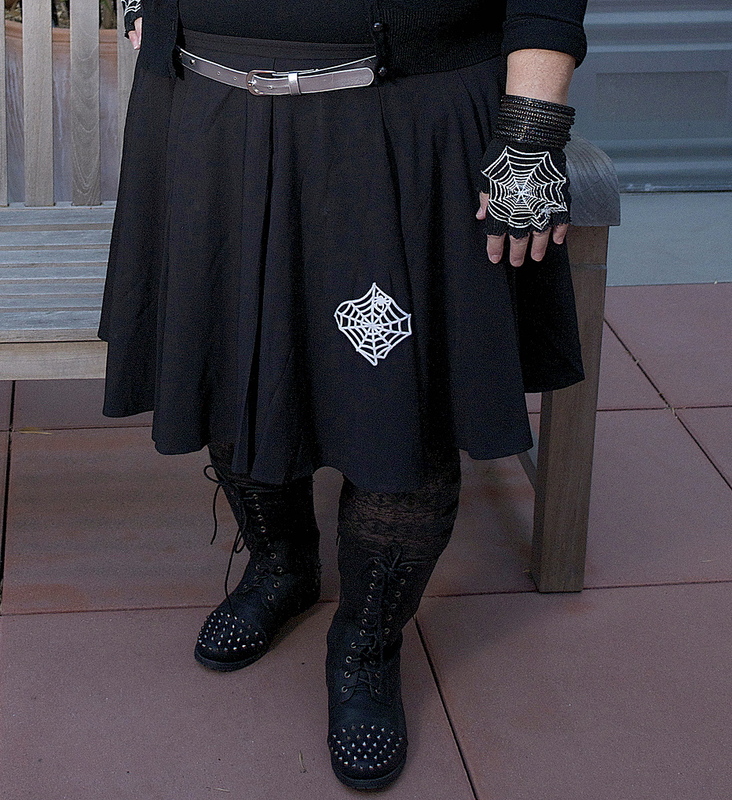 Spiders freak me out, but I LOVE everything about this outfit! !